The Holidays are just behind our backs now considering that we have now entered the quarter of cold season. The “ber” months are here and it’s slowly living up to people’s expectations of it. Since every time this season arrives coldness and the cool weather is what most people notice, of course it also is associated with different ailments and illnesses. A lot of times, cold weather is directly associated to “colds season” which is in fact most absolutely true. Here in our country, the common cold is a normal thing to Filipinos and yes it is not that easy to cure. You may need to buy proper medications and observe proper rest however, there are home remedies available to help you with what you are feeling. In this article, I will be listing down home remedies that can be a good – even better – alternative for medicine. We all are aware of the magnificent miraculous makings of water and yes, one of the best and natural cures for the common cold is just the water therapy. You will be able to clear out the stuffy part of your nose, you will be able to rehydrate yourself in order to release the mucus, and a lot more. 1. Drink 2 glasses of water when you wake up. 2. Drink one glass of water one hour after you drank 2 glasses of water. 3. Drink 2 glasses after lunch; and so on. The technique here is to fully reserve yourself with water without any window for dehydration. Havng colds can rehydrate you since it causes a lot of muscles for you to sneeze, it releases mucus that formed inside your body, and it make your head hurts. Drink 2 glasses of water every meal and make it a habit to drink at least 1 glass of water every hour. Steam is probably one of the most effective ways of clearing up your stuffy nose. In order to make it more effective, adding certain ingredients such as Eucalyptus or Tea Tree Oil can hasten and enhance the process. 1. Put the oils at the bottom part of the bowl and then pour boiling water in it. 2. Start the process by placing your face over the bowl at a comfortable distance because doing it not in the proper way can damage you instead of healing you. 3. Once you found your rhythm, lower your face down CLOSE as comfortably as possible. 4. Have the towel as a guard to trap all the steam that gets out of your area. 6. Do this for 5-10 mins for 2-4 times – EVERY SINGLE DAY. Of course, everything that is not delicious is healthy and can be beneficial to our health. Ginger is one of those and yes, it is extremely effective in clearing up that stuffed nose of yours. So if in any case you come across a left ginger inside your home, do not think twice to pick it up and to help yourself with it. 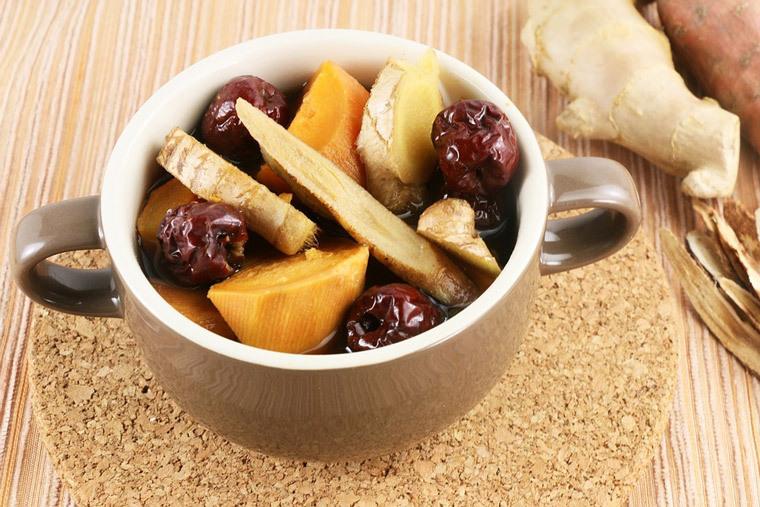 – Ginger (preferably ginger roots; you can grate it); 6-8 table spoons of it. 1. Bring the water to a boil and there it is, it is all set. 2. Once you have the desired boil, pour it in the container where your ginger is placed (preferably in a glass jar). 3. Make sure to cover the jar to keep the escaping steam to the jar because it has the essential materials in it. 4. Place it covered for about half an hour and it is ready to go. Make sure that you store the rest of the tea in the refrigerator (only up to 24 hours) and just reheat if necessary. Also, ensure that you breathe in the steam of the ginger; drink it at least 3-4 times a day together with other home remedies in this list. Cold and hot compress has been the bread and butter of most Filipinos who encounter ailments like this. Yes, it is very much effective and it should be practiced because it is natural and it is not that expensive. 1. Bring the water up to a boil and then store it to your vacuum flask to keep it heated and warm. 2. Pour some over the water bottle or ice bag and then ensure that the lid is tightly sealed. 3. Layer a piece of clothing around the bottle or ice bag so that you won’t get burnt by the heat of whatever you are dealing with. 4. You can lie on the bottle or bag between your shoulder blades or you can place that on top of your chest as well. This method helps cure congestion in the chest and in the neck area. Repeat this 2-3 times daily along with the other home remedies in this list for faster and more accurate results. Now this one is actually a rare type of cure but I am pretty sure that most Filipinos would get and love this cure. It involves spicy things – you guessed it right, peppers. Yes, the constituent in making peppers hot is in fact called capsaicin; it has tons of health benefits and one of those is that it can help loosen up congested areas of your respiratory system. 1. Take a bite on the hot pepper or on the chili or any spicy food you can have. 2. Taking the hotness to a broth however is largely beneficial because as you get water and fluids, you sweat, you get the actions, and you get to feel the hotness you consume. This is an effective way of decongesting yourself. As per the others, do this along with other more remedies to ensure a fast and obvious recovery. These are just a few of the best home remedies you can do in order to cure yourself from the common cold. The cold season is here and it is just best to remain prepared with home remedies besides taking on medicines that might be too expensive or too hard-to-find.